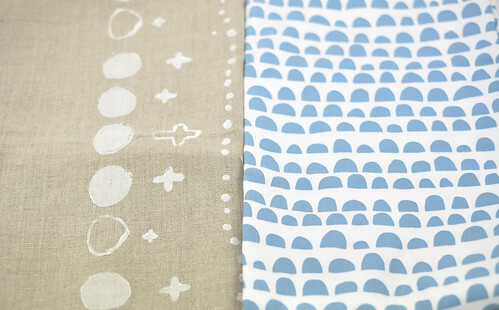 one week to go until the postage deadline for handprinted: a fabric swap! it's been pretty quiet out there - or have i just been to busy to visit everyone's blogs? let me know in the comments if you have posted about your printing, i'd love to see what every one has come up with. and if you haven't started, dive in! and from suzy and jesse breytenbach. 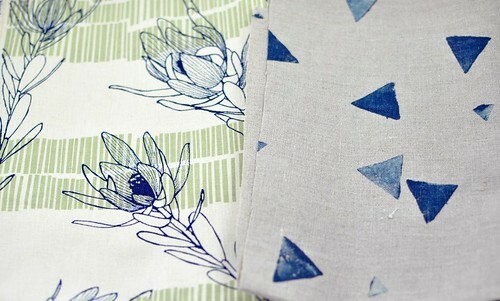 You got some gorgeous fabrics last time; they look amazing together! I posted about the playing around I did to finalize a technique for the swap here. Leslie, the fabric you were sent for the last swap are great! I love the blue hills! I JUST printed my fabric today, and gotta say I love the way it turned out! I had a friend over and bought her lunch for her help in holding my screen and prepping fabric. Pictures to come! i've been quietly obsessing over this for the last couple of weeks. thinking about my design, looking for inspiration, becoming paralyzed with indecision. mostly because there are so many things i want to try. will be printing today and hope to have it mailed out by the end of the week! 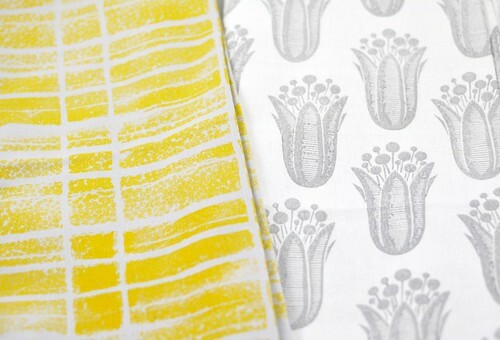 love the fabrics in your post! now off to see what the other participants who've shared came up with.